The PGS 300 is designed to meet the requirements and standards in the chemical, pharmaceutical and food industries as well as for LifeScience and nuclear technology. The PGS 300 is made for grating, shredding, crushing, desaglomerating, granulating of solid dry or humid substances. Depending on the raw material and grating or shredding cylinder, the throughput can be as high as 4,000 kg/h. 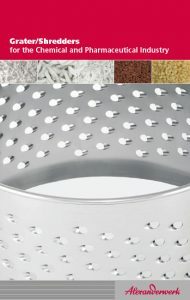 Grating and shredding cylinder with holes are available to achieve different granule geometries. Moreover, the mobile design provides great flexibility during granulation and allows an easy maintenance.